This volume provides insight into the pivotal roles of stem cells, exosomes and other microvesicles in biofunction and molecular mechanisms and their therapeutic potential in translational nanomedicine. It further highlights evidence from recent studies as to how stem cell derived exosomes and microRNAs may restore and maintain tissue homeostasis, enable cells to recover critical cellular functions and begin repair regeneration. These early studies in animal models of aging also show evidence of improved immune, cardiovascular and cognitive functions as well as improved health span and life span. The use of exosomes from body fluids to define specific biomarkers for various tumors may also clear the path to patient-targeted treatments by developing exosome-derived microRNA based cancer therapeutics. It is essential reading for graduate students, research fellow and biomedical researchers in academia or the pharmaceutical or biotech industries. Mesenchymal stem cell-derived exosomes are at the forefront of research in two of the most high profile and funded scientific areas – cardiovascular research and stem cells. 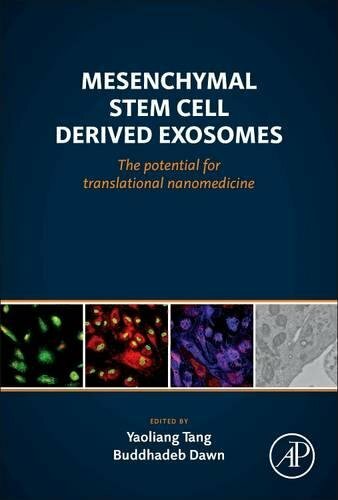 Mesenchymal Stem Cell Derived Exosomes provides insight into the biofunction and molecular mechanisms, practical tools for research, and a look toward the clinical applications of this exciting phenomenon which is emerging as an effective diagnostic. 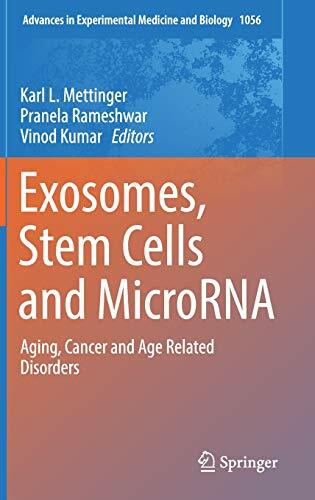 Primarily focused on the cardiovascular applications where there have been the greatest advancements toward the clinic, this is the first compendium for clinical and biomedical researchers who are interested in integrating MSC-derived exosomes as a diagnostic and therapeutic tool.